The Superstar Shakeup begins on Raw in Montreal, travel delays affecting talent & personnel, Sami Zayn discusses his new direction, CIMA signs with AEW, Kurt Angle discusses retirement & more. *British Wrestling Experience with Martin Bushby & Benno and special guest Jamesie – review of Pete Dunne vs. Walter from TakeOver, Progress Wrestling’s “Breadknife” & more. 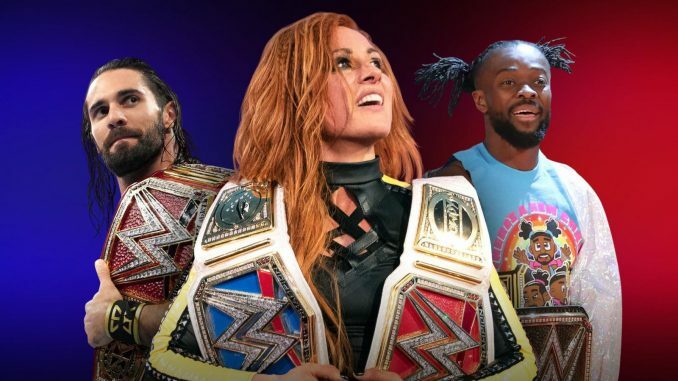 **The WWE’s annual Superstar Shakeup begins tonight with back-to-back nights at the Bell Centre in Montreal. We were told that there were travel delays today affecting both personnel and talent leading to some re-writing of the show. One person estimated that the travel issues affected as many as 20 people between talent and personnel getting to the show. There will be lots of news coming out of Raw and SmackDown this week with all the roster moves, future directions for key talent and post-Mania plans. Beyond the shakeup, nothing else has been advertised for either show. **Pat Laprade of TVA Sports spoke with Sami Zayn ahead of the shows in Montreal this week. In the chat, it was noted that Zayn signed a three-year extension with WWE prior to his shoulder surgeries last year. Zayn noted he’s been dealing with inflammation in his shoulders and isn’t 100% where he would like to be. He credited former WWE writer Robert Evans with the idea of attacking the fanbase as his new direction and was very hand on with his promo on Raw. He did work with another writer, but Zayn wrote the promo. Zayn also said he doesn’t want to rely on cheap tactics to get booed and take a more nuanced stance with his treatment of the audience. He recognized he would have more promo time if he was on Raw because of the length of the show but being on SmackDown opens the doors for the exposure on Fox in the fall. **On Monday’s release of Being the Elite, it was announced that CIMA has signed a full-time deal with All Elite Wrestling. The Japanese star, who was instrumental in the rise of Dragon Gate and now with OWE, was previously announced for Double or Nothing on May 25th. CIMA is scheduled to team with two members of OWE against Christopher Daniels, Frankie Kazarian, and Scorpio Sky in Las Vegas next month. **Inside the Ropes has been forced to change the plans of their upcoming shows involving The Undertaker. Originally, he was scheduled to do a Q&A show and meet-and-greets on April 29th in Manchester, April 30th in London, and May 1st in Glasgow. Event organizer Kenny McIntosh announced that Undertaker will still appear for the meet-and-greets but cannot participate in the Q&A sessions. In his place, Mick Foley has been added to the shows for the Q&A portion. **A rematch between WALTER and Pete Dunne for the NXT UK championship has been announced for this weekend’s tapings in Glasgow, Scotland at Braehead Arena. **The WWE stock continues to climb and closed at $97.25 on Monday. **The pre-sale for AEW’s Fight for the Fallen event is this Thursday from 9 am – 9 pm Eastern. The public on-sale is this Friday at 10 am. The pre-sale code is ‘AEWFIGHT’ with the show raising money for the Jacksonville Victim Assistance Advisory Council. The Fight for the Fallen event will take place on Saturday, July 13th at the Daily’s Place Amphitheater, which is connected to TIAA Bank Field in Jacksonville, Florida. The venue has a capacity of approximately 5,500 people (depending on the production set up) and this should be an immediate sell out for the group. **Ring of Honor has announced two title matches for their War of the Worlds tour next month. On May 8th in Buffalo, the Guerrillas of Destiny will defend the ROH tag titles against Jay Lethal and Jonathan Gresham. On May 9th in Toronto at the Ted Reeve Arena, Matt Taven will defend the ROH title against PCO. Yuji Nagata and Satoshi Kojima will be on all four events in Buffalo, Toronto, Grand Rapids, and Villa Park. Hirooki Goto will be on the final three shows, but not in Buffalo. **Fightful has reported that Ronda Rousey is set to undergo surgery for her broken hand on Tuesday. Rousey suffered the injury during the main event of WrestleMania with the belief it took place as she was delivering punches. Rousey is under contract to WWE for another two years but there is no timetable on when she is expected back. It will be interesting to see if she is addressed this week on the Superstar Shakeup and assigned to a specific brand. You would imagine they would want Rousey to make an appearance on Fox when SmackDown moves to the network this fall. Honestly? My Wrestlemania 35 match. I would have liked to go out with a win, but I understand why it didn’t occur. Many people believe that I should have had a different opponent. Maybe. Maybe not. But my argument as to why it should have been Corbin is pretty strong. As a HOFer and Legend in WWE, I came to my final match last Sunday. It was my retirement match. As a legend or HOFer or- whatever you want to call me, my job is to leave the WWE by doing the honors for a younger talent. I did that. I would have loved to have won, but I don’t think I would have properly played my role if I did. You leave the company better than it was before you came. I think I was able to do that by losing to Corbin and then getting laid out on Raw the next night to Lars. It may have felt wrong, but it was the right thing to do. Agree to disagree. Angle said his three choices for his retirement match would have been John Cena, AJ Styles, or Seth Rollins. **New Japan Pro Wrestling has announced the first names for the G1 Climax opening night card in Dallas on July 6th. IWGP heavyweight champion Kazuchika Okada, Jay White, Kota Ibushi, and Tetsuya Naito are being promoted for the show, although they have not announced if they will be in tournament matches yet. The G1 participants and blocks are still to be announced although the four will be part of it. **MLW’s Fusion program premieres on FreeSports in the U.K. and Ireland today at 10 pm. It will air weekly in this slot on the channel. **New Japan’s Road to Wrestling Dontaku continues this week with a show on Wednesday in Fukui and Thursday in Toyama. The big show of the week is Sengoku Lord this Saturday headlined by Kota Ibushi vs. Zack Sabre Jr. for the Intercontinental title and Juice Robinson vs. Bad Luck Fale for the United States title. **There is a feature story on WWE in this week’s Sports Business Journal describing how they develop talent. Velveteen Dream, Bianca Belair, Xia Li, and Kacy Catanzaro are on the cover of the issue. **PAC will defend the Open the Dream Gate championship against Dragon Kid at Dragon Gate’s Dead or Alive card on May 6th in Nagoya, Japan. **The WWE Network has added over 30 episodes of Mid-South to the streaming service from August 1984 through April 1985. **I wanted to make mention of Impact Wrestling from this past Friday. Specifically, the pairing of Ethan Page and Josh Alexander as “The North”. The two were a tremendous team on the independent level before Alexander had a severe neck injury, that he thought was career-ending and turned out he could return to wrestle. They had a quick tag match and Alexander looked tremendous in the match. They had a series of double-team maneuvers that looked great. Backstage, they cut a promo with Page finally get more time on screen to speak, which is a big strength. The signing of Alexander and pairing him with Page have been two strong moves by Impact. On a recent feature they produced on Alexander, Page stated that Alexander is the best guy on the Impact roster, which covers some ground. **Jenn Decker will be hosting the Double or Nothing weigh-in and press conference next month in Las Vegas. **Humberto Carrillo proposed to his girlfriend, Tania Ramirez, during WrestleMania Weekend in New York City. **I would be remiss if I didn’t start out with the two incredible fights from Saturday’s UFC 236 card. There would be many years that Dustin Poirier vs. Max Holloway would have won the fight of the year with Saturday’s fight and they didn’t even have the best fight of the night in Atlanta. That’s because Israel Adesanya and Kelvin Gastelum had an all-time classic and one of the best fights I have ever watched. I cannot imagine another fight topping that middleweight fight in 2019, and if it does, this will be an incredible year of fights. There is always going to be some recency bias, so I hesitate to rank that fight so quickly afterward, but by the end of the year when people are reflecting, I feel it’s going to be discussed in concert with the greatest fights ever. As Phil Chertok mentioned on our POST Show, there were similarities to the first fight between Jon Jones and Alexander Gustafsson from UFC 165 and Jones overcoming an early deficit to win that fight. I had Adesanya and Gastelum even after four rounds with Adesanya winning the fifth round 10-8 and 48-46 overall. If you missed this card, try and watch the final two fights as they are my 1-2 best fights of 2019, so far. **UFC president Dana White said that Robert Whittaker vs. Israel Adesanya needs to take place inside a stadium in Australia and that’s what they are working towards. Initially, White said the fight would take place in the United States but changed his mind after Saturday’s card. The new plan for Australia is the right call as there will be enormous demand and I would assume a lot of travelers from New Zealand that would go to the show. Adesanya has stated he would like the fight to take place in Auckland. It’s also an interesting by-product of the ESPN+ deal that with a fixed amount of income guaranteed, they can be more bullish on international pay-per-views. Typically, international shows are affected by less general media interest in North American and underperform unless there is something enormous like Ronda Rousey’s fights in Brazil and Australia in 2015. With this new deal, it’s less of a risk for the UFC and I believe any short-term issues with staging a fight of that magnitude is more than made up with the roots you are developing in that market with a seminal fight involving those two, who mean so much more to that market. **The UFC 236 card drew 14,297 to the State Farm Arena in Atlanta and did a gate of $1.9 million. The last time they ran the venue was in July 2006 for UFC 201 (when it was still the Philips Arena) and drew 10,240 and a $1,070,000 gate featuring Tyron Woodley defeating Robbie Lawler to win the welterweight title. **There was no Performance of the Night bonuses at UFC 236, instead, they issued two Fight of the Night bonuses to the top two fights on the card with each receiving an extra $50,000. **The UFC returns this Saturday with an early show from St. Petersburg, Russia headlined by heavyweights Alistair Overeem and Alexey Oleinik. It’s an ESPN+ card with the prelims airing at 10 am Eastern and the main card at 1 pm.